Is it not a praxis of evil that uses secret evidence against its enemies yet holds itself inscrutably above the law? Will George Herbert Walker Bush go to his grave without ever being held accountable for his actions in Dallas on 22-23 November 1963? How can the Hoover memo and the Kitchel memo be explained? Will President Barack Hussein Obama be the one to force this issue into the open? Former Arkansas Governor Mike Huckabee's stupid joke about "somebody" aiming a gun at Obama still serves as a good starting point for a serious discussion about the JFK assassination. And Obama would be reaching out to the vast majority of Americans who don't believe the Warren Commission Report. 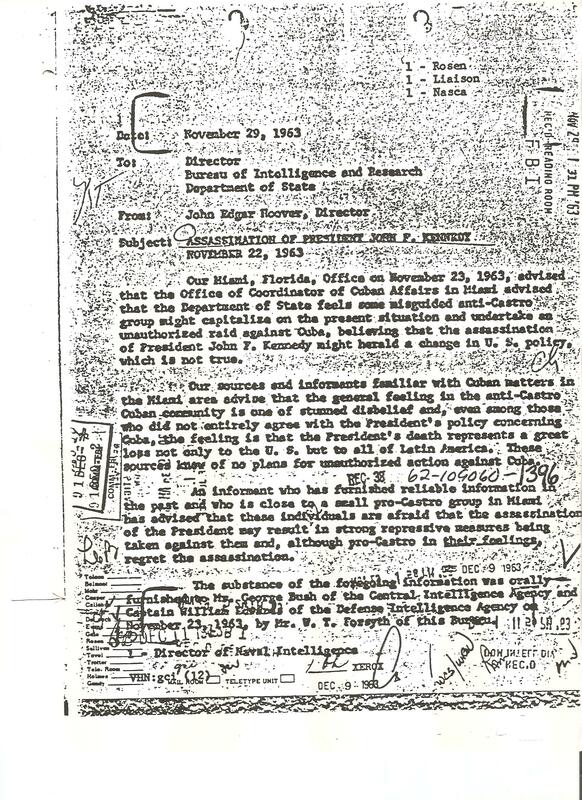 Our Miami, Florida, Office on November 23, 1963, advised that the Office of Coordinator of Cuban Affairs in Miami advised that the Department of State feels some misguided anti-Castro group might capitalize on the present situation and undertake an unauthorized raid against Cuba, believing that the assassination of President John F. Kennedy might herald a change in U. S. policy, which is not true. Our sources and informants familiar with Cuban matters in the Miami area advise that the general feeling in the anti-Castro Cuban community is one of stunned disbelief and, even among those who did not entirely agree with the President's policy concerning Cuba, the feeling is that the President's death represents a great loss not only to the U. S. but to all of Latin America. These sources know of no plans for unauthorized action against Cuba. An informant who has furnished reliable information in the past and who is close to a small pro-Castro group in Miami has advised that these individuals are afraid that the assassination of the President may result in strong repressive measures being taken against them and, although pro-Castro in their feelings, regret the assassination. The substance of the foregoing information was orally furnished to Mr. George Bush of the Central Intelligence Agency and Captain William Edwards of the Defense Intelligence Agency on November 23, 1963, by Mr. W. T. Forsyth of this Bureau. 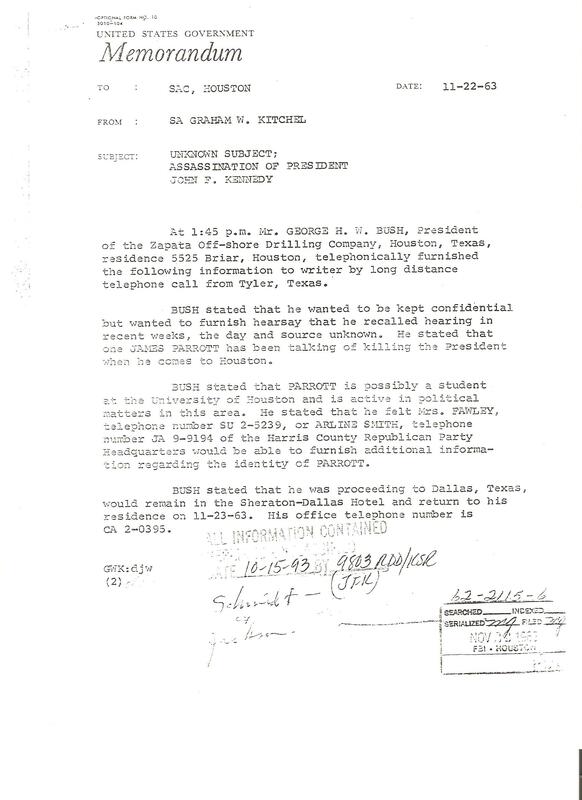 At 1:45 p.m. Mr. GEORGE H. W. BUSH, President of the Zapata Off-Shore Drilling Company, Houston, Texas, residence 5525 Briar, Houston, telephonically furnished the following information to writer by long distance telephone call from Tyler, Texas. BUSH stated that he wanted to be kept confidential but wanted to furnish hearsay that he recalled hearing in recent weeks, the day and source unknown. He stated that one JAMES PARROTT has been talking of killing the President when he comes to Houston. BUSH stated that PARROTT is possibly a student at the University of Houston and is active in political matters in this area. He stated that he felt Mrs. FAWLEY, telephone number SU 2-5239, or ARLINE SMITH, telephone number JA 9-9194 of the Harris County Republican Party Headquarters would be able to furnish additional information regarding the identity of PARROTT. BUSH stated that he was proceeding to Dallas, Texas, would remain in the Sheraton-Dallas Hotel and return to his residence on 11-23-63. His office telephone number is CA 2-0395. For more information on how these two memos shed light on each other, visit Letter to Rehnquist at http://www.show-the-house.com/id6.html.